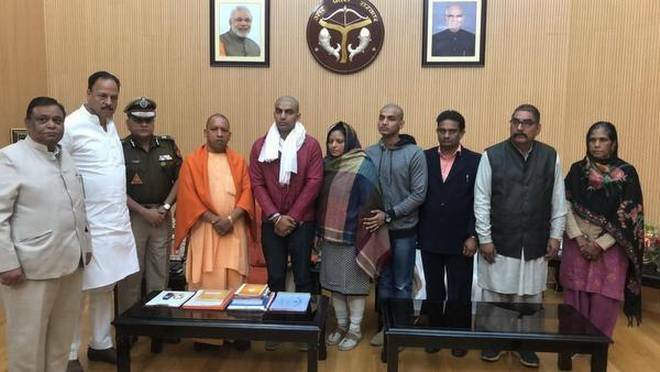 Uttar Pradesh Chief Minister Yogi Adityanath on Thursday met the family members of Inspector Subodh Kumar Singh who was killed in the Bulandshahr violence and assured them of justice and strict action against the culprits. The Chief Minister met Singh’s wife and two sons at his Kalidas Marg residence in Lucknow, an official spokesman said. “The CM has given assurance to the victim’s family that they will remain like a family and there would not any disturbance in their studies,” UP DGP OP Singh, who was also present there, told reporters. He said Mr. Adityanath had decided that the government would pay off the education loan that the family had taken. Mr. Adityanath had declared on Monday a compensation of ₹ 40 lakh for the wife, ₹ 10 lakh for the parents and a government job for a member of his family. Mr. Adityanath had held a late night meeting on Tuesday with the chief secretary, the DGP, the principal secretary (home) and the additional Director General of Police (intelligence). The Chief Minister had also drawn flak from opposition parties for attending a laser show in Gorakhpur when the violence broke out in Bulandshahr on Monday. An official spokesman said the chief minister was of the view that the incident “is part of a bigger conspiracy, and hence all those directly or indirectly related to cow slaughter should be arrested in a time-bound manner”.